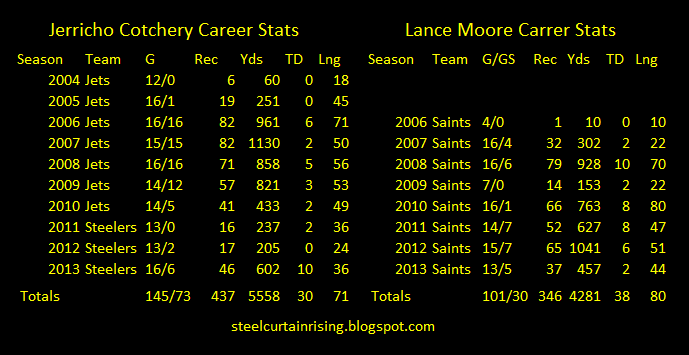 Steelers Sign Lance Moore; How do Moore and Cotchery Stack Up Side-by-Side? Jerricho Cotchery’s seat in Pittsburgh didn’t have much time to cool. Less than 24 hours after Cotchery cu and ran for Carolina, the Pittsburgh Steelers moved to replace him with Lance Moore, free agent wide out from New Orleans. When Cotchery left, Steel Curtain Rising indicated that Pittsburgh was losing more than your average 3rd NFL wide receiver. It appears that they might have replaced him with someone who is at least above average at the position. Lance Moore broke into the NFL as an undrafted rookie free agent with the Cleveland Browns in 2006. He didn’t make the team, but New Orleans picked him up. He had one reception in his rookie year, but steadily worked his way into a significant part of one of the NFL’s most potent offenses. Moore comes to the Pittsburgh Steelers with 346 catches to his name for 4281 yards and 38 touchdowns. He also worked as an accomplished punt returner in 2010, although at age 31 those days would figure to be behind him. His experience playing in a prolific offense with a Hall of Fame level quarterback should be of great use to the Steelers, not only on game days but in helping develop second year receivers Justin Brown and Marcus Wheaton, as well as third year receiver Derek Moye. A proven veteran in the film room and on the practice field can do a lot for the development of young players in terms of teaching and leadership. As Neal Coolong, also of BTSC pointed out, Moore’s 2013 season in New Orleans was ruined by injuries and he found himself overlooked by Drew Brees when he got on the field, seeing his production drop by 60%. But the Steeler s need both experience and depth at wide receiver, and Moore brings both. In pure quantitative terms, Cotchery has the edge. But Cotchery also has two more seasons of experience on Moore and 43 more starts. In qualitative terms the comparison gets more interesting. Moore’s career yards per catch is 12.4 a hair lower that Cotchery’s who clocks in at 12.7. Moore has average 3.4 catches per game and 42.4 yards per game, which edges out Cotchery’s 3.0 catches per game and 38.3. And, for some armature saber metrics. These numbers don’t carry the depth that Pro Football Focus’s does, but then again, those guys get paid to do what they do. So what do they really mean? Well, Cotchery’s role for the Steelers in 2013 was as “The guy who scores touchdowns.” Perhaps these numbers suggest that Moore is uniquely suited to take his place. Ben Roethlisberger is said to covet another tall wide receiver. Another Plaxico Burress. Moore only stands 5’9″ so he doesn’t fit the bill. But here’s betting that Ben will be happy with someone who comes up with it in the end zone. This entry was posted in Steelers 2014 free agent focus, Steelers 2014 off season and tagged Ben Roethlisberger, Jerrico Cotchery, Pittsburgh Steelers, Plaxico Burress. Bookmark the permalink. Can Debo Do for Steelers What Jerome Bettis Did?